The AU8000 sprayhead is working great attached onto my Solo 451 Mist Blower, as well as with my liquid formulations. I am filtering the liquids through a 100 mesh screen prior to spray application. I have sprayed a series of different types of plants which includes blueberries, various garden vegetables ( tomatoes, potatoes, carrots, brussel sprouts, broccoli, beans, beets), ¼ acre of hops and pear trees. 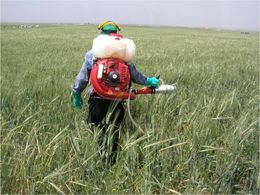 I am spraying on a weekly basis to reduce the negative effects of insects. I have also used the sprayer on our hostas and roses. 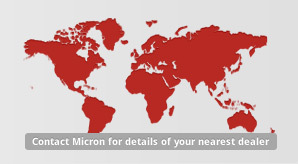 The Micron AU8000 Sprayer is a highly efficient knapsack sprayer using rotary atomiser technology originally developed by Micron for agricultural aircraft. The knapsack incorporates a 17 litre chemical tank and a 2-stroke engine driving a highly efficient air blower. 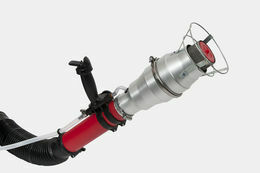 A flexible air duct connects the blower to an AU8000 sprayhead. This contains a rotary atomiser which is driven by adjustable fan blades in the airstream from the blower. 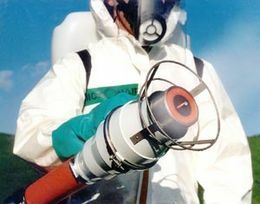 The atomiser is fitted with a cylindrical metal gauze which produces spray droplets of a precisely controlled size by rotary atomisation. The airstream carries the droplets safely away from the sprayer and ensures complete penetration and coverage of the target. Chemical flows from the knapsack tank to the atomiser via an interchangeable restrictor tube for reliable and accurate control of application rate. The moulded handle of the sprayhead incorporates an easily operated on/off valve for control of output. Lower application rates mean a greater area sprayed per tank and less re-filling time to ensure maximum productivity. Air assistance and controlled droplet size ensure efficient penetration of dense foliage. Minimum use of water simplifies spraying in arid areas. Elimination of run-off and wastage result in reduced chemical usage. Pest control in warehouses, storage areas etc. Pest and disease control in orchards, vegetables, rice, cotton, tea, coffee etc. 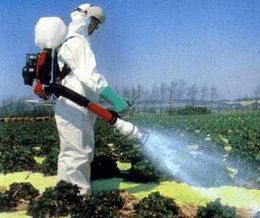 Spraying inside greenhouses and plastic tunnels. 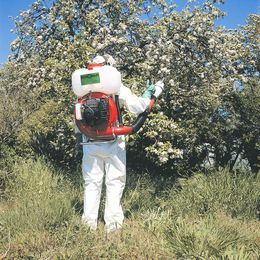 The wide flow range and adjustable droplet size mean considerable versatility so the sprayer can be used for any application rate or type of chemical from ultra low volume to several hundred litres per hectare. As well as being supplied as part of a complete sprayer, the AU8000 Sprayhead is also available as a conversion kit for suitable mistblowers. 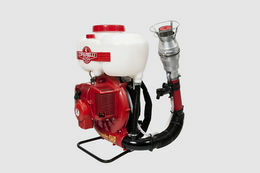 The kit includes connecting tubes, handle/control valve, restrictors and all attachments needed to replace a standard mistblower outlet. This kit is suitable for most types of 5HP machine (For satisfactory operation, the air output from the mistblower must be 100 - 125 m/sec at the outlet). The airstream from the sprayhead carries spray droplets away from the operator and ensures that they are safely deposited on the target. This minimises the risk of operator contamination and drift. The controlled droplet size enables a minimum amount of carrier liquid and chemical to be used, whilst ensuring that the maximum amount is deposited where it is needed. This eliminates the problem of run-off in agricultural spraying and greatly assists in the control of chemical residues on fruit and vegetables. 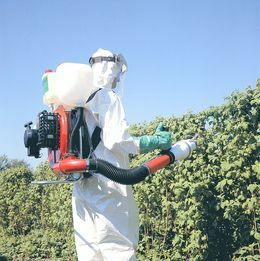 In public health and migrant pest spraying, the elimination of large, wasteful droplets ensures good control with a minimum of chemical.